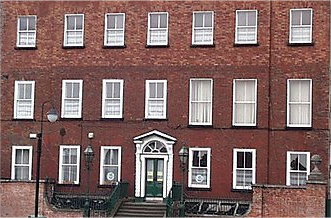 Situated in an historic part of Dublin's Prussia Street, number 55 was formerly the City Arms Hotel, prior to that it was the home of the Jameson family, the well known distillers who came over to Dublin from Scotland. They built this imposing residence on the site which was adjacent to their distillery works. In the late 1700's the premises were occupied by H.S. Reilly, a Royal Canal director after whom the canal bridge at Rathoath Road is named. He is the same Squire O'Reilly of Burtons strange topographical romance entitled 'Oxmantown'. John Jameson is shown as the occupier of the premises according to the Primary Valuation of 1850, when the house together with the outhouses and yard, on an area of over seven acres, had a listed valuation of £126 per annum. James Joyce frequented the City Arms Hotel when he lived in St. Peters Terrace, Phibsboro, and indeed has immortalised the premises in Ulysses where it is mentioned a number of times. The ‘Joycean’ characters Leopold and Molly Bloom lived in room number ‘9’ from 1893 to 1894 while Bloom was employed as a clerk in the Cattle Market which was situated beside the building on the junction of Prussia Street and the North Circular Road.